Hey, hey, hey! It's July 1, 2015 which means Chad and I are celebrating 20 years of wedded bliss! 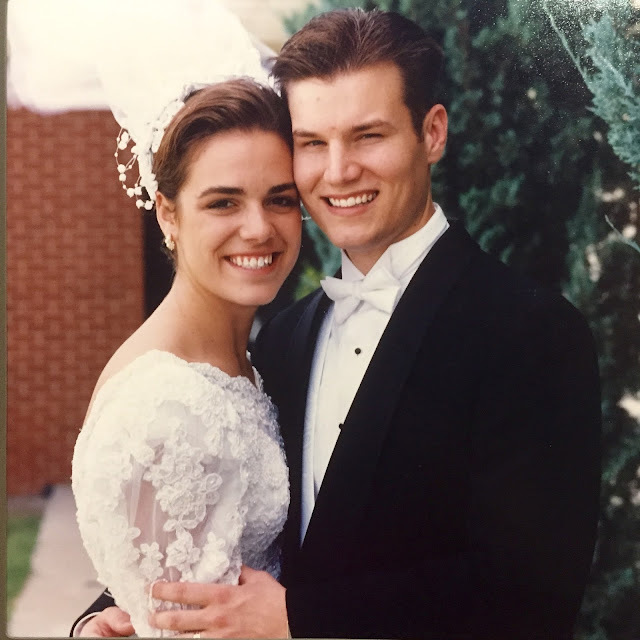 Twenty years of love, ministry, fighting, making up, raising kids, moving to different countries and different states, opening our home, crying and laughing, deep conversation, cheesiness beyond imagination, and so so so much more. I'm so blessed by this man. He loves me well. I can't express to you the fun we've had over these 20 years. I pray God allows us at least 20 more years together. We are also starting our two week vacation today. The timing is perfect and somewhat stressful. As I mentioned in the last post, a house remodel was forced upon us. But good news: the finished bathroom is amazing! Chad's goal was to finish everything before we left so we could come home and not have to pick up the hammers and paint brushes right away. Perfect timing. It is stressful because we are in crunch time to move into our new church building. For my readers who do not attend Second Mile, we are calling our new facility El Centro. 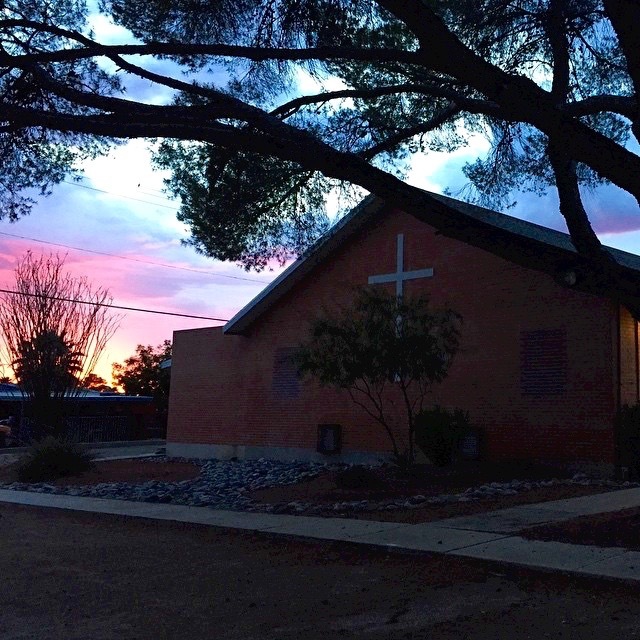 For ten years, we've benefited from the generosity of other Tucson churches, so our body experientially learned that we are the church, not a building. We don't want to lose this deep truth in our ethos, so we are choosing not to call our new space "the church" because the people are the church. Our first Sunday at El Centro is August 2nd, which means work needs to be accomplished...and we are leaving for two weeks. Oh man, stressful timing. The good news is we are a group, a body of people who work together, and we have leaders and lists in place to make the next few weeks efficient and effective. Have I ever mentioned that I love my church? So, so much. The front of our new space. Photo taken by my good friend, Nate E.
If you are still checking in for scripture memory, let me congratulate you on staying the course for more than half the year. Great job! You are working to make this a true discipline. When I come to a transition in my own personal bible study and I'm not sure what to do next, I head to the gospels to hear from Jesus, so I've been reading through Matthew. As you all know, this world is no easy place to live. As a follower of Jesus, I want to make sure I'm pointing to him in my actions and in my speech. "Love wins" is all over the place right now, and every time I see it I think of John 15:13. "Greater love has no one than this, than someone lay down his life for his friends." Love that truly wins is about laying down your life, your agendas, your ideas, your rights, your self-righteousness, your contempt, your stubbornness, your status, your everything, the way Jesus did. His love wins because it never fails. I want to be more and more like him in how I love people in this life. This is not meant as a slight towards anyone who uses "love wins." This is a caution to my fellow followers of Jesus to be sure you are showing Whose love is the ultimate winner. I'm familiar with this passage so I'm hoping it will be easy to memorize. I want it to be a reminder of how I want to live in our ever evolving culture. Far be it from me to be a resounding gong or a clanging cymbal, but have no love. "You are the salt of the earth, but if salt has lost its taste, how shall its saltiness be restored? It is no longer good for anything except to be thrown out and trampled under people's feet. You are the light of the world. A city set on a hill cannot be hidden. 15 Nor do people light a lamp and put it under a basket, but on a stand, and it gives light to all in the house. 16 In the same way, let your light shine before others, so that they may see your good works and give glory to your Father who is in heaven." Please share what you are memorizing. It would also be encouraging if you would share how you decide what you will be memorizing. Do you have a system? Do you randomly choose passages? Do you go for single verses or whole sections? Many blessings to you as you seek to know and show true, steadfast, winning love!